Globe GoSAKTO menu is the best way to maximize your budget for a call, text and data promo by simply dialing *143# on your phone to create your own. Subscribing to this method lets you decide how many minutes of call you need, number of texts (within the same network and to all networks), size of data (MB or GB), hour or days of validity and additional exclusive app access. 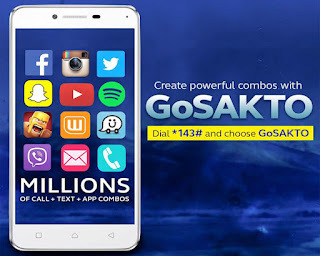 The good things with GoSAKTO promo is its flexibility and very budget friendly. In terms of validity, you can choose from 1 day, 7 days or 1 week and up to 1 month depending on your budget and needs. If you do not want to go with the usual Globe *143# USSD code dialing process, you can easily browse the list of popular GoSAKTO offers from call, text and surf combo promos provided below. Note: To subscribe to any of the above promo, you need to send all the keywords to 8080. To stop any of the promo above, just text the keyword GOSAKTO STOP then send to 8080. You can also access all the offers above by dialing *143# the select GoSAKTO or option 1, go to Discover Promos / option 5, Popular Promos / option 3 then select any listed promo of your choice. You can also create Globe promo online by visiting Globe website.